CoRoS provides SAP consulting with extensive experience in SAP R/3 and expert knowledge in Data and Document Archiving, Document Management, PDM, Imaging, Workflow, and PLM. Focusing on this niche has allowed us to gain specific knowledge that we pass on to our customers. This niche focus is not found in any competitor. It allows us to be the best at what we do. We form strategic partnerships with leading industry software companies to leverage the synergy effect of leadership in archiving and imaging solutions for SAP customers. We offer turnkey archiving solutions, individually designed for our customers' requirements. 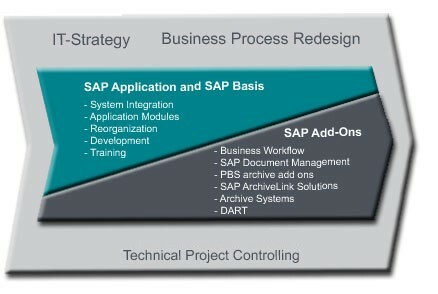 Our SAP Workflow packages are fast and easy to implement. We guarantee up to date product and process knowledge. We utilise "best practices" that we have acquired through our numerous years in the SAP Archiving and Add-on software field. We employ only skilled consultants with comprehensive project experience to ensure the quality, commitment, and standards of the consultants we place at your site. Numerous customers have already profited from coros's in-depth knowledge, and quality of consultants. The economic efficiency and effectiveness of your implementation is ensured through CoRoS's project management. Not only can CoRoS's project management methodology be used for the introduction of SAP R/3, but it can also be applied to the implementation of SAP Add-on Products. By providing project planning, project organisation and team leadership, CoRoS puts a special focus on efficient project controlling. We focus on the individual features of each project, which determine the project-specific and company-specific project management tasks. Customer Focus - Each project is unique. Economic efficiency can only be achieved if the individual situations of the customer are integrated into the IT-solution. Process Focus - Only the optimisation of business processes increases the return-on-investment. Quality Focus - A successful implementation encompasses considerations about future adaptations in the present concept. Implementations that run out of their time and budget constraints can impact the whole company. CoRoS has developed tools and techniques (early warning systems) to identify variances from the plan as early as possible which enable us to dynamically react. Modern organisations constantly face new challenges that can have a dramatic impact on their current and future success. The global economy and dynamic technologies drive many of these challenges and organizations must find ways to overcome them. To do so, organisations must rely on the proper vision, insight, leadership, and experience to ensure success for years to come. CoRoS Consulting is here to help with our experience and success in delivering mission critical technology solutions to our clients. CoRoS Consulting's mission is to maximise our clients' return on their business software investment by delivering the highest quality and most cost-effective Applications Management, Hosting and Professional Services solutions. CoRoS Consulting's goal is to provide our clients with real business solutions that empower them to face their challenges and to deliver tangible business results. CoRoS Consulting was formed in 2003 to provide our clients with cost-effective business and technical solutions for their Tier-1 business software applications. CoRoS' initial offering was providing a wide range of implementation and professional services to companies requiring additional expertise during their implementation efforts. CoRoS continued to refine and develop its implementation and professional services to offer SupportLine Remote, a complete, end-to-end managed services solution that provides expert systems administration, development, and functional support . This refined foundation has fueled CoRoS' natural evolution into a premier provider and experience to provide leading edge business solutions to customers' complex business issues. CoRoS Consulting's solutions help our clients embrace the challenges they are facing and gain a competitive edge by reducing costs, improving efficiency, increasing information-sharing with partners and suppliers, improving customer service, and exploiting new business opportunities. To better serve our clients' needs, CoRoS offers specialised solutions that best address our clients' key strategic needs. Our team will analyse your company's needs and develop a flexible solution that will meet your initial requirements as well as incorporate a teamwork approach that will ensure the long-term success of the solution. We concentrate on developing strong, harmonious, and deep relationships with our clients, working as an "extension of our client's IT team." We make our solutions flexible by providing our clients with the capability to use the CoRoS Consulting team to compliment their internal team's expertise and/or to maximise the utilisation of their scarce internal resources. Additionally, CoRoS Consulting recognises that people are the most important aspect of implementing and supporting the applications and delivering the services. Consequently, we place high importance in matching skills and personalities with our clients' needs in addition to designing the appropriate solution. We have invested capital and years in developing our processes, tools, infrastructure and human resources to provide our clients with the highest quality and most cost-effective solutions. Our extensive experience in supporting the requirements of Enterprise Applications has enabled CoRoS Consulting to become a valuable partner to our clients by helping them maximise their IT ROI and lower their TCO. Our reward is client satisfaction and to ensure that we are providing the highest level of satisfaction, we closely monitor our clients' satisfaction levels with our services. Staff at CoRoS Consulting have been involved in over thirty ERP implementations (Archiving, Imaging and DMS/PLM) and in successfully providing technical and functional ERP and Messaging solutions for over eight years.